Yeah, I know, I know, I missed a post yesterday. We have been a bit busy at work lately, as we are moving to a new building, and we are currently the last ones in the old building, so there is a lot to get done. Back on the wagon today. 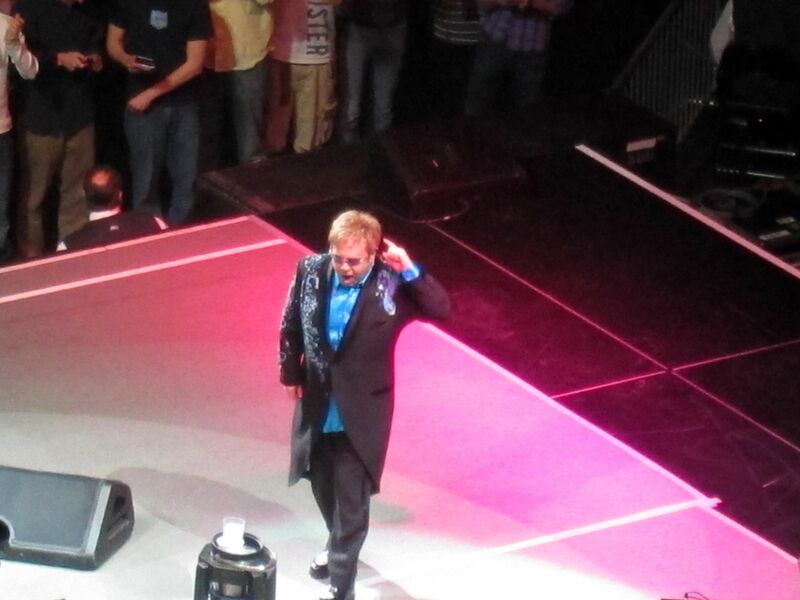 Last night I had the pleasure of attending the Elton John concert at the CONSOL Energy Center in Pittsburgh. 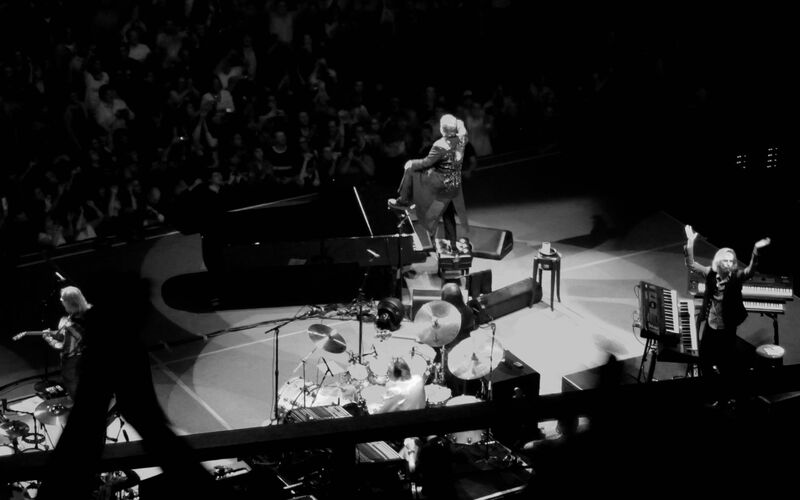 Now, I am a huge classic rock fan, and while I do enjoy Elton’s music, he wouldn’t be in my top 10 of favorite musicians, but let me say this: It was awesome. I mean, he really rocked the stage, it was incredible to watch him play, overall an immensely entertaining show. He kept the crowd engaged, standing up and acknowledging all four sides of the stage after every song and even took the time to sign autographs before his encore, probably about fifty or so people that he let come up and stand by the stage for his last few songs, which included Bennie and the Jets and Crocodile Rock, along with his encore of Your Song. 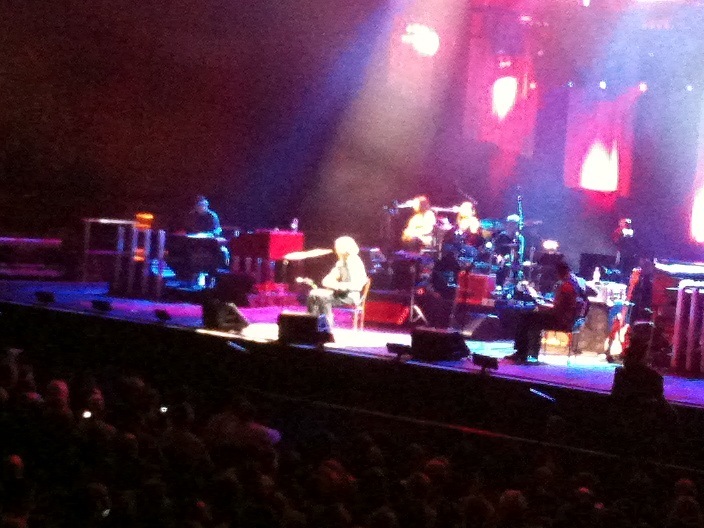 Shots from this concert were taken with a Canon S95. I did find the concert very enjoyable…except for the eight songs that he did with Leon Russell right in the middle of the show. I know that Russell is a Rock and Roll Hall of Famer, but it just really seemed to detract from the energetic vibe of the rest of the show. The songs were slow, very few people knew them, as they were from the collaborative new album between Elton and Russell. Other than that, awesome show. 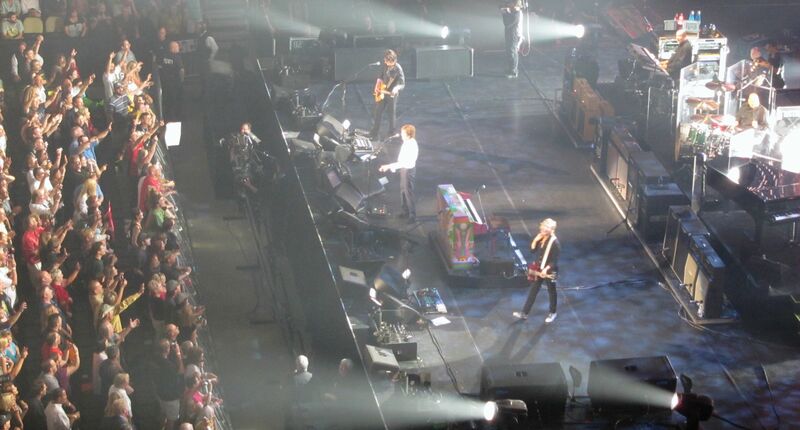 Back in August, on opening night of the CONSOL Energy Center, before any hockey game had been played, I was in attendance to see former Beatle Paul McCartney. 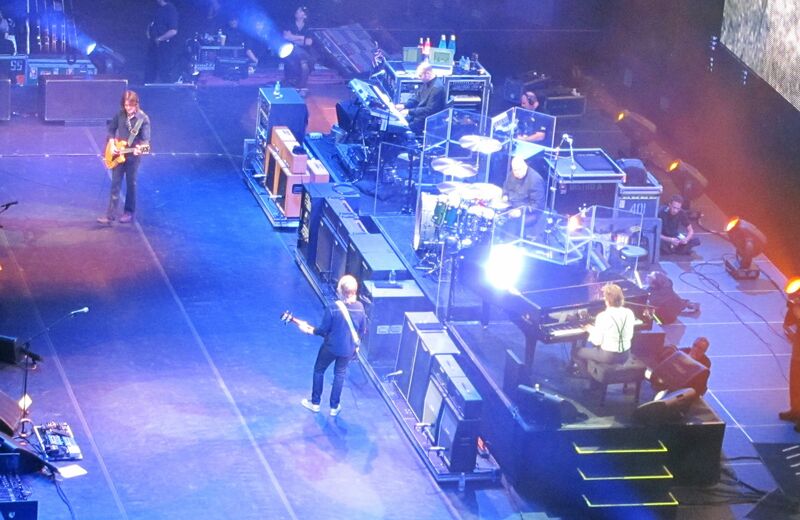 In regards to entertainment, Sir Paul most definitely put on the best show I have ever been to. 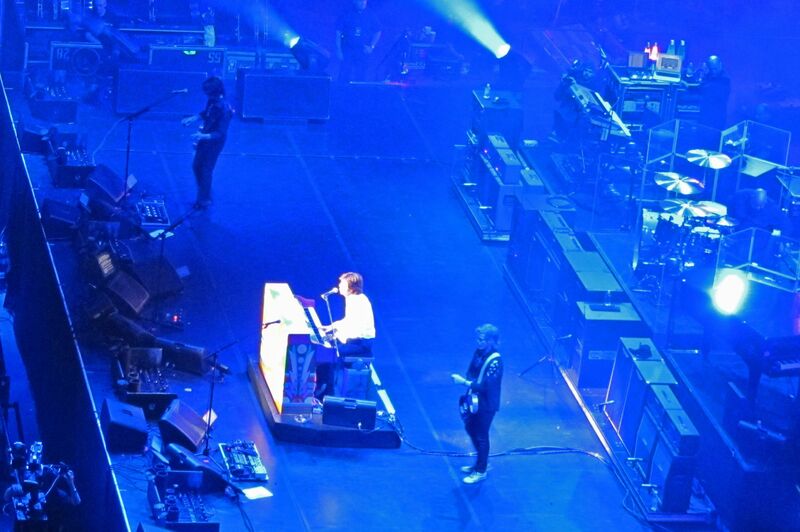 It also helped that I knew the majority of the songs played and could sing along (not that anyone would want to hear that), but being able to see a legend like McCartney, that is a once in a lifetime thing, at least at this point in his career. 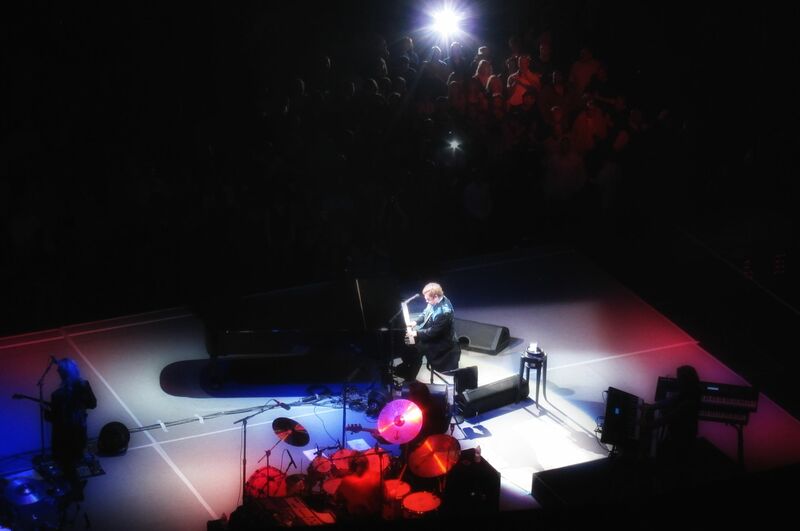 For this concert I had my Canon S90. 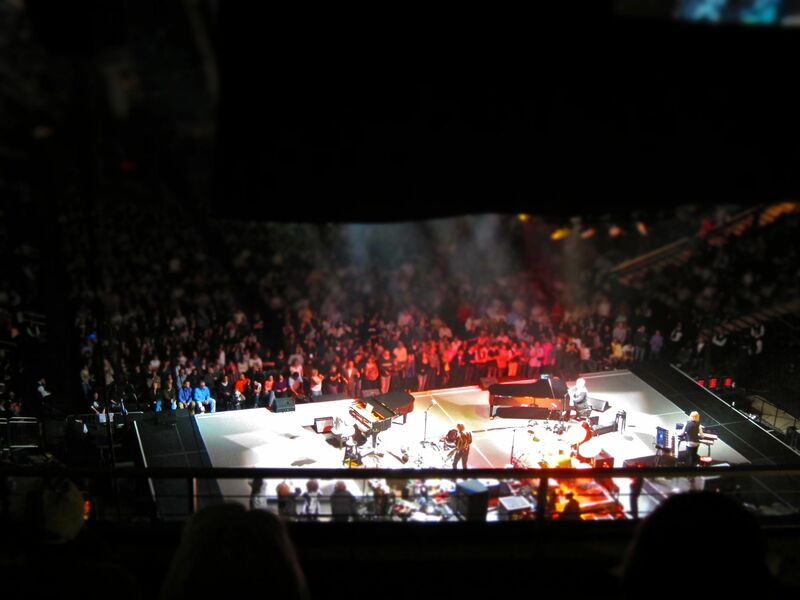 Finally, last March we attended an Eric Clapton concert at the old Civic Arena. 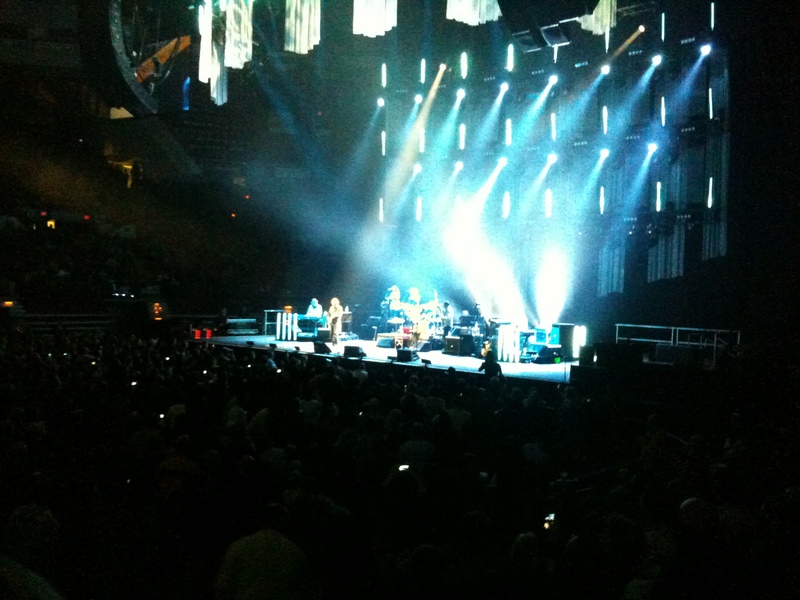 I know that I just said McCartney put on the best show ever, but Clapton’s music was just mesmerizing. When they showed his hands making that guitar sing like it wasn’t anything at all was truly something special. Clapton is not the same kind of entertainer as Elton and Paul, but he put on one hell of a show and I would gladly go back to see him again. Didn’t have a great camera with my this time though, so just iPhone shots for this one. 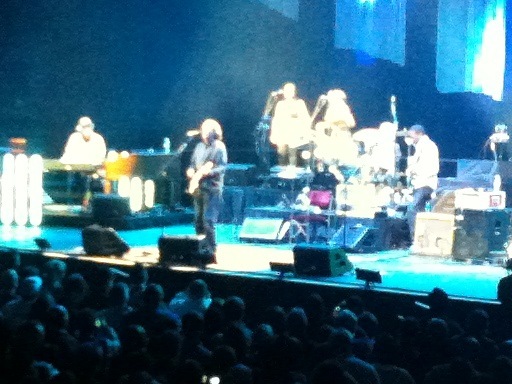 I am very fortunate that I was able to see three of the great rock/pop musicians of our time in my hometown. I don’t go to many concerts, but when I do, I make it worthwhile. 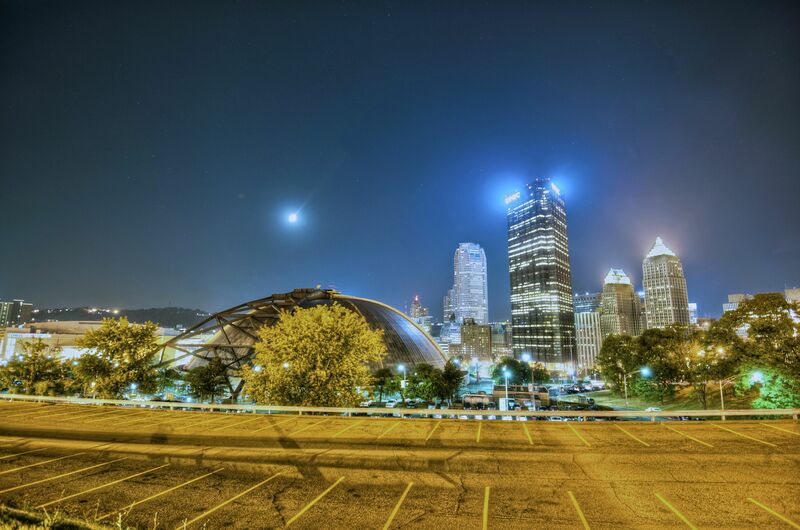 Speaking of these Pittsburgh hockey arenas and to go along with the nighttime Pittsburgh skyline, here is a shot of both. I took this a few weeks into the season form the upper parking lot above the Civic Arena and had to hold up a lot of traffic to do so. People honking, yelling, screaming while I just threw up my hands and said, “It’s bracketing nine exposures at night, it takes a lot time, what do you want me to do?” One way to shut people up is just to confuse them! I thought that it would only be fitting that I post a picture of the two hockey arenas in Pittsburgh since I posted the football and baseball stadiums the last couple days. 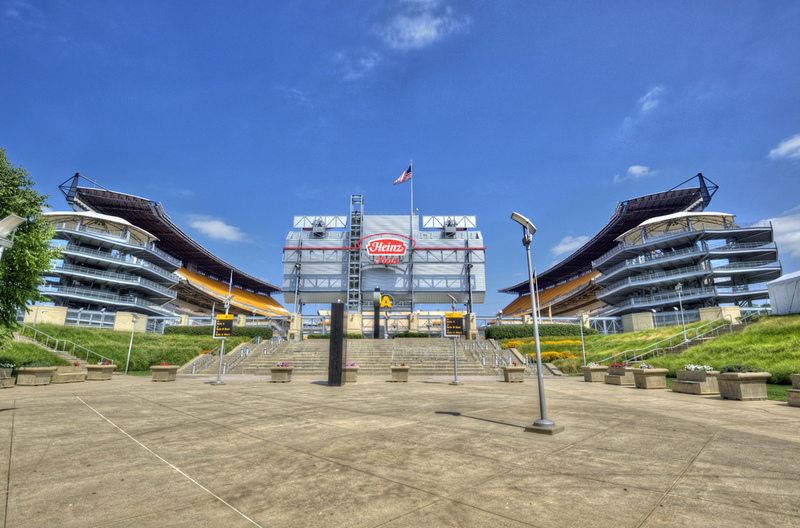 The city of Pittsburgh truly has been blessed with some incredible sports venues, and both of these are no exception. I did a write up on Mellon Arena, the old home of the Penguins a view months back, when I was blogging every month and a half or so. I wanted to take some time and talk about the sporting arena in general, especially those in Pittsburgh. Now, we haven’t always had the good fortune of having three of the best venues to watch professional sports in the country. It all started back in 1895 with the Schenley Park Casino, which was Pittsburgh’s first multi use arena, and the first arena in the country to have an artificial ice surface. It was destroyed in 1896 by a gas explosion. That was succeeded by the Duquesne Gardens, which played host to a variety of sports teams, but mainly the Pittsburgh Pirates (who became known later as the Penguins…totally different from the baseball team, as the baseball Pirates have been around since the late 1800’s). Duquesne Gardens was the first arena to actually have glass above the dasher boards, developed by (you guessed it) Pittsburgh Plate Glass (ok, so maybe if you weren’t from Pittsburgh you didn’t guess it). It stayed open from 1899 until 1956, when it was destroyed as the city was beginning construction on the new Civic Arena (more on this in a bit). But that was strictly for basketball and hockey. The Pirates (baseball) needed a home too. They first played at Exposition Park, which was located not too far from the current location of PNC Park along Pittsburgh’s North Shore. They played their home games there for almost 20 years, from 1890 until 1909, when they moved to the famous Forbes Field. Here they would share the stadium with the Pittsburgh Steelers and University of Pittsburgh Panthers until 1970. However parts of the field still remain around Pittsburgh today. You can see the left field wall over which Bill Mazeroski hit his legendary home run to beat the Yankees in Game 7 of the 1960 World Series, as well as a statue of Maz outside of PNC Park (pictured above). You can also find the home plate from Forbes Field in Posvar Hall at the University of Pittsburgh’s campus, very near its exact location in the park, and the outline of the outfield wall still remains. Two separate fires sadly forced the demolition of this historic venue in 1971, being replaced by Three Rivers Stadium. Three Rivers, aptly named for being where the Allegheny and Monongahela Rivers meet to form the Ohio near the Point in Pittsburgh, played home for the Pittsburgh Pirates and Steelers for three decades. It was built in the era of “cookie cutter” stadiums, very drab on the outside, and not much better on the interior. In fact, for baseball games, they had to tarp off sections of the seats directly behind center field, as it would interfere with the batters’ ability to pick up the ball from the hand of the pitcher (newer stadiums simply do not have seats there, including PNC Park). The park could be reconfigured to suit both football and baseball, but by the early 1990s, talks had begun to get the Pirates their own stadium and remodel the existing Three Rivers to be strictly a football venue. In July 1999, over $800 million worth of funding was approved for both Heinz Field (pictured above) and PNC Park (pictured below), and ground was broken to begin construction in 1999, with both teams enjoying their new homes for the 2001 seasons. I’ve only ever seen one game in Heinz Field (and it was a hockey game, the Winter Classic), but it is one of the most unique football stadiums in the country, with the open end giving spectators a view of the city of Pittsburgh and the Point. PNC Park is consistently voted the most beautiful baseball park in the country, again having one whole side of the park open and being able to see the entire city skyline. As for the Civic Arena (pictured below), home of the Pittsburgh Penguins from 1966 until 2010, I won’t go into a lot of details since I’ve written about it before. Feel free to check out that post. I will mention that it was the first domed sporting venue that had a retractable roof, though it has not been functional for over a decade. One interesting fact is that when it opened it contained only 12,508, just eight seats over the minimum NHL requirement for capacity. In August of 2010, the CONSOL Energy, pictured above, opened and it makes the Civic Arena look like something from ancient Rome. Don’t get me wrong, I love the “Igloo” as the Civic Arena was nicknamed, there is something about old sporting venues that you just have to appreciate. But CONSOL is the new model that arenas will be built around in the future. I took the last shot, which is today’s upload, on my photowalk last Saturday morning. I did the best I could to include all both the Civic Arena and CONSOL in the photo, but this is literally as far back as I could stand, as there was a fence and a steep fill behind me. This is a side of the building that I’ve captured before, though you weren’t able to see the Igloo in the background. For the processing, this is a seven exposure HDR processed in HDR Efex under the Clean HDR Method. Masked in the entire sky as well as the flags, as it was really windy on this particular morning and I had crazy ghosting effects. Overall desaturation and then added a blue curves layer for the sky, as well as a Tonal Contrast Filter from Color Efex, then finished it off the with a High Pass Sharpening filter. I hope you’ve enjoyed this little walk down Pittsburgh sports arena memory lane. Catch you tomorrow.